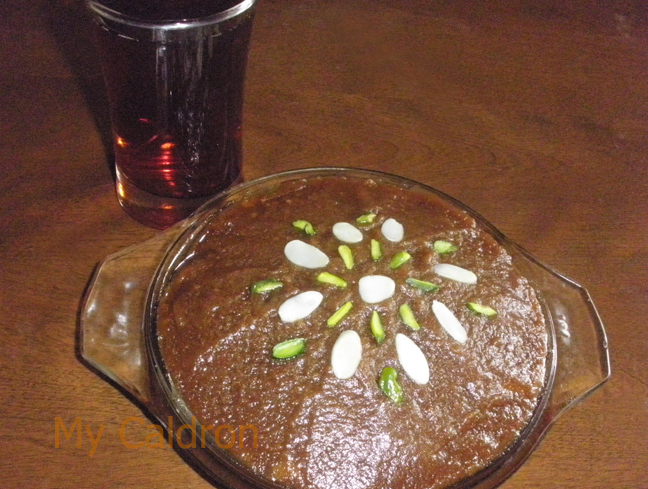 Halva-aardi , a chocolate brown, sweet confection made of white flour, is typically served with dates and tea at most funeral services–passed on a plate with a fork or spoon placed at the side for people to help themselves. It is also served as a dessert—especially after ghalyeh or other types of seafood, and ideally with tea. Halva is very easy to make in theory but could be tricky in practice. My mother used to make flawless halva each and every time she did it: chocolate brown, noticeably sweet and anghosht-pich (finger-rolled) so that it was just solid enough to roll around a finger without dripping. Ok let’s get to its theory here – right after the Persian text.